Leonardo DRS has been selected by the U.S. Army to demonstrate its On-Board Vehicle Power on Terminal High Altitude Area Defense missile battery command and control, and launcher vehicles. The electrical power system improvements will give air defense operators immediate access to electrical power directly from a vehicle’s power train. To meet the Army’s power needs, OBVP systems are integrated with the vehicle transmission to generate up to 55kW of usable electrical power while on the move or up to 120kW of usable electrical power while stationary. The Leonardo DRS OBVP system has proven it can increase battlefield agility, reduce deployment logistics costs, and improve mission readiness with no impact on vehicle functionality. A 2016 U.S. Army Tank Automotive Research, Development and Engineering Center Vehicle to Grid study reported a 23% fuel savings over Tactical Quiet Generators when employing OBVP technology for grid power. In development since 2008, Leonardo DRS OBVP systems have successfully performed in various technical demonstrations and evaluations to include the Army Expeditionary Warfare Experiment, Network Integration Evaluation and the U.S. Marine Corps Limited User Test. It is now a mature system that is ready to address mission power requirements. “This proven system will provide our customers with a solution to address the growing electrical power gap affecting all military ground vehicle platforms,” said Jerry Hathaway, vice president and general manager of DRS Land Electronics. “Leonardo DRS and our partner, Allison Transmission, have been long-time believers in OBVP technology. We are very pleased with the leadership of the DoD, specifically the Army TARDEC, in demonstrating technology that can address the ground combat vehicle power gap,” Hathaway said. Leonardo DRS, partnered with Allison Transmission, will jointly provide existing OBVP systems based on the Allison 3200 SP transmission and will develop an OBVP system for the Allison 4500 SP transmission. Both systems will support the THAAD vehicles used for command and control and missile launchers. To date, Leonardo DRS OBVP technology has been integrated on various medium-class platforms, it can support the Stryker, FMTV, M-ATV, MRAP vehicle types. This award will expand Leonardo DRS OBVP technology onto the heavy-class platforms which include HEMTT and MTVR vehicles. 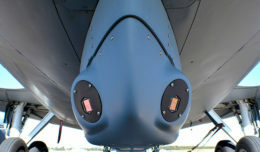 With the capability to generate power beyond the Army’s stated 120kW requirement, the system is ready and able to support Mission Command, Command Post, Missile Systems, Maneuver SHORAD, Directed Energy Systems and High Energy Laser programs; improving battlefield operations with highly reliable, mission assured power, anywhere and anytime. Work on this program will be conducted at Leonardo DRS’s facilities in Huntsville, Ala., and Fitchburg, Mass. Allison Transmission’s work will be conducted in Indianapolis, Ind.